The Dartmoor Society Award 2011 was presented by Chairman Dr Tom Greeves at the Society’s 13th Annual General Meeting held at Scoriton on 16th April. The Award is made annually to individuals or groups who, in the opinion of the Society, have made a special contribution to Dartmoor. In the form of a ceramic plate, the Award is uniquely crafted by potter Penny Simpson of Moretonhampstead and calligrapher/artist Susanne Haines of Bovey Tracey. 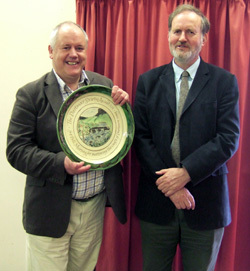 Bill Murray’s plate is inscribed ‘The Dartmoor Society Award 2011 – for Bill Murray for nurturing the craft of Dartmoor song’. At the presentation, Dr Tom Greeves said that for more than forty years Bill Murray had kept alive the tradition of unaccompanied singing in the Dartmoor region. He had worked closely with the late Bob Cann, and had sought out people with knowledge of songs in Dartmoor communities, and had been closely involved with every one of the thirty-six Dartmoor Folk Festivals based in South Zeal. He had also undertaken historical research and had composed music for some songs which had none surviving. In 2008 he produced (with Wren Music) a CD of songs and music titled ‘Down ’pon Old Dartymoor’. Tom Greeves said, ‘Bill Murray is a consummate performer of often long and complex songs, rooted in the Dartmoor tradition. He has an unassuming manner which belies the humour of much of what he shares with his audiences. His contribution to the story of Dartmoor singing is immeasurable, and his Award is richly deserved.